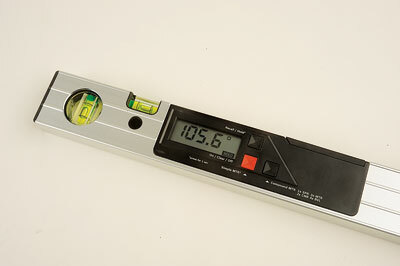 Bosch has gained a reputation for devising all manner of professional tools including sophisticated measuring equipment such as this model. The GAM 220 MF is designed to take the stress and inaccuracy out of marking and cutting angles for installation work. We decided to take a look and see if this device really lives up to its specification. It's formed from two aluminium extrusions, which are fixed to swivelling aluminium castings at one end. It looks very much like a typical, well turned out short spirit level and indeed it does have two vials with levelling bubbles if, like me, you appreciate working with conventional levelling aids. However, the lower extrusion incorporates the digital angle measuring aid, which is what this piece of kit relies on. Insert the four AA cells correctly and settle down to read the manual because without it you'll be rather at sea unless you can pick things up intuitively. The red button switches it on, off and clears the reading. The top button allows you to hold a reading and recall it later when you need it. The bottom right-hand button switches between angle setting modes. Switch on, open the legs and press the device against the adjoining angles to be measured and read off what the LCD panel says. You can transfer the angle on to a component by drawing against the angled leg as well. Measure what they refer to as the 'spring angle' or projection of a cornice for instance by pressing mode button so 'SPR' shows, then measure the 'corner angle' by pressing the mode button until 'CNR' shows. Press the same button and 'MTR' shows, so you can obtain the correct mitre cut angle on your compound mitre saw. Press again until 'BVL' shows and this will show the calculated bevel angle. There are the usual provisos about not pressing buttons to avoid cancelling recalls and so forth. You really need to work with this device for some time so operation becomes fluid each time you take measurements to then convert to divided cut angles. It is quite a heavy piece of kit considering a lot of mitre cuts could well be done overhead. Itâ€™s really rather large for working on small items. In fact outsize for a lot of fitted furniture activity, better for measuring the situations you intend installing into or for other building works. 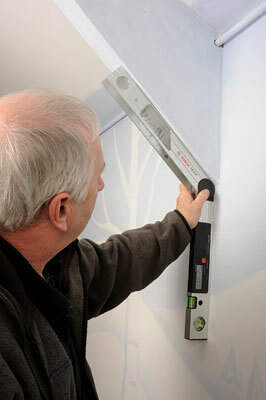 The extension piece is handy for taking angle measurements in window reveals and other awkward situations. If the device is set at an acute angle but you need the opposite, i.e. obtuse angle, you need to subtract the acute measurement from 180 degrees to get the obtuse result, so keep a calculator handy. Capable of very accurate results but a bit fiddly to use. A smaller, scaled down version would suit cabinetmakers rather better I feel.